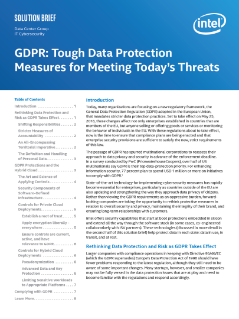 Today, many organizations are focusing on a new regulatory framework, codified in the General Data Protection Regulation (GDPR) developed by the European Union (EU), that mandates stricter data protection practices for doing business with member countries and requires that handling and processing of personal data meet rigorous stands. Set to take effect on May 25, 2018, these changes affect not ...only enterprises in countries that are members of the EU, but anyone doing business within the EU territories or processing the data of EU citizens. With these regulations about to take effect, now is the time to ensure that compliance plans are being enacted and that enterprise security provisions are sufficient to satisfy the new, strict requirements of this law. Watch the video to see how PhoenixNAP is launching new cloud services for CSPs with help from Intel and VMware. Microsoft Azure* is offering innovative cloud services with hardware-based security, featuring Intel® Software Guard Extensions (Intel® SGX). Intel and IBM drive innovation together with a focus on top-notch performance and security, enabling differentiating services in the market. Deploy a secure, efficient, optimized infrastructure with a container platform solution. Discover why end-to-end security is needed for cloud and 5G success and how the Intel® Xeon® Scalable processors can help.